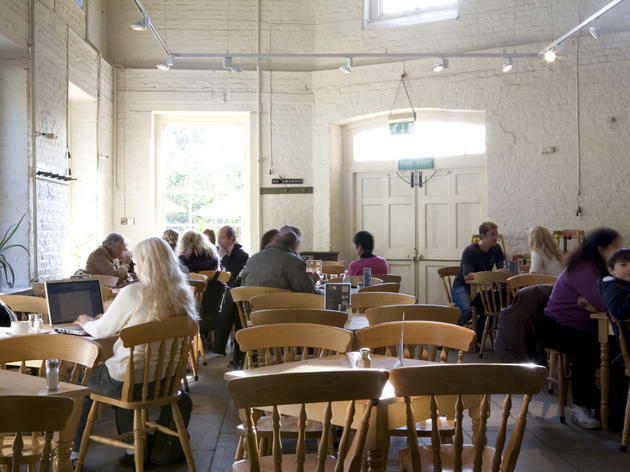 A cafeteria at Kenwood House, run by Searcy's. I visited this restaurant May 7th with a party of four and a small child. A bit disappointed when I saw that we had to do 'the que with tray bit', but there were no hold-ups and I have to say that the food was excellent for all of us. The salmon, and the sauce on it was gorgeous. Healthy deserts too - rhubarb and yoghurt - we had a nice time and the surroundings are so lovely. Unlike the 1-star recommendation, I visit often and none of those negative comments ring true to me. It must have been a bad day. The only negative I would give is that everything is pricy. On the other hand, all the food I have ever had there has been first class, tasty, excellent quality and various enough for this sort of eatery. If one has one of their hearty soups, the bowls re filled to the top and, with the bread, it is a meal in itself. The sweets and cakes are also delicious. Queueing varies but staff are always helpful and try to add a till to speed things up. 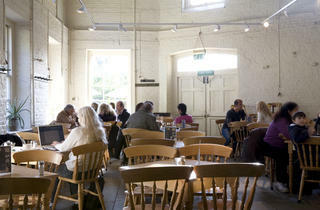 With 2 indoor rooms, there is plenty of seating and, on sunny days, eating their food outside is bliss. A lovely setting for a coffee or drink at the end of a walk in Hampstead Heath. However, the wine was pretty average and the glasses dirty. Cake was fine but nothing special. It's a shame there aren't any better options around here because with a bit of competition, this place would have to lift its game a bit. I hope people appreciate what a treasure this place is. It is not a destination restaurant, it is an idyllic setting in which to get a wholesome, affordable meal or just some tea and cake. One of my favourite things to do is enjoy Kenwood House's art treasures (FREE!) and then sit outside with friends or reading the paper. We have NOTHING like it in NY's Central Park where our Tavern on the Green was turned over to a high-end company serving up over-priced bad food, mostly to tourists. I love the mix of people at the Brew House and hope it endures for years to come. Food lukewarm and unappealing. Very disappointing, and not a good advertisement for the catering at Kenwood House. If I was planning an event here, the food in the Brew House would have put me right off. The lazy catering here is a real turn off. If I could give a negative rating it would best describe this place. Met up with a friend from out of London for breakfast and we went here based on web articles and reviews. The vegetarian option was boring and definately not worth the price. No thought went into this menu - no vegetarian sausages or Quorn alternative. The scrambled eggs looked completely undercooked and I decided not to chance it, so what I was left with was nothing but vegtables and toast. We queued for a long time mostly because of the annoying couple in front of us, but by the time we got to a table I was very hungry. What was on my plate was tastless and the only semi palatable item was the cold toast. The mushrooms were so salty I had to drink a lot to compensate it, the spinach was just mush and the tomatoes were just tomatoes. I was so unimpressed I had to apologise to my friend and we vowed not to visit this place again. I'm glad I came straight home afterwards because I was ill for the rest of the day and it just ruined my day. Never again! If this is what passes as good cuisine in London, I better just stay and home and cook for myself.